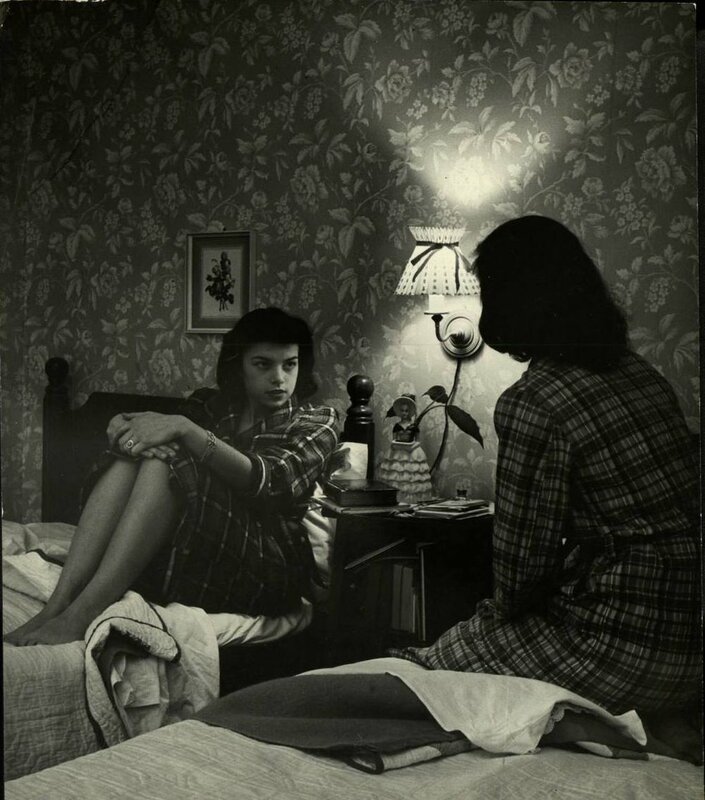 Nina Leen, Teenage Girls (St. Louis), 1944. © Time Inc. Some years after the matter was thought to be settled, Jules found an unopened letter in the trash can. The envelope peeked out from beneath clamshell buoys and crushed beer cans. She brushed away the runoff of her father’s discarded meal, revealing a red, white, and blue stamp stuck to the envelope’s edge. With her pocket knife, she slit the paper’s rim. Each page was neatly folded and textbook-dense with words. After reading through, Jules stuffed the pages into the pocket of her cutoffs and walked to my house. My mother ushered her into the living room, where the rest of us were gathered around the TV set, ignoring an old movie about good guys and bad guys. Cars chased other cars through back alleys and side streets as my father and his friend descended deeper into a conversation no one else could follow. My little sister, sandwiched between them on the couch, was quietly retracing capital letters in her kindergarten script. “How should I know?” Jules turned her gaze from the letter’s ink to the TV’s glare. On-screen, bullets were shattering a T-Bird’s windshield. “The calls don’t get much closer than that,” panted the movie hero. He brushed bits of glass from his hair and jean-jacketed shoulders and took the hand of his permed co-star. Together they dashed into the woods. During a commercial break, my mother brought in some Ritz and dip. She hovered over our shoulders like a glowing street lamp. Instinctively, I threw my hands over the letter. This, of course, made it seem all the more suspicious. “He must be handsome,” my mother said, which both relieved and incensed me at the same time. “Very,” said Jules, tugging on my bracelet. “Mika’s all the rage with boys these days.” A lie if there ever was one. Yet my mother, with a rare full smile, seemed obliged to believe it. “First mate on Dad’s boat,” said Jules as her mouth ballooned with crackers. She could put away an entire sleeve in one sitting. I wondered what Jules’s pantry looked like at home. For as much time as we spent together, I hardly ever went to her house. All I remembered was the stench of seasickness and the murky yellow of the light. Tourists ruined my family; my mother was one of them. She met my father. They had me. I guess that makes me 50% tourist. Then my mother found another tourist like her, and they ran off to Bali or Hawaii or Shangri-La—someplace where they could hang out with even more tourists and ruin even more people’s lives and walk around yacht decks in tiny bathing suits and laugh at the children they left behind. Predictably, certain scenes made their way not only into Jules’s psyche but into the collective psyche of Alma’s residents. Leaving town, at least this town, meant that you sacrificed whatever story you had. The people who remained could dictate who you were, what part you played, the scenes in which you were allowed or forbidden to appear. And what image of extravagance did our collective psyche conjure up when we thought of Jules’s mother? Olympic-sized swimming pools, boats ten times the size of Jupiter, pâtéd hors d'oeuvres, swarms of butlers with perfect posture and well-timed bows. In our minds, she was the loathsome tourist, forever complaining that her chowder was too hot. The ocean was too cold. Everything was so unbearably salty. But now Jules possessed a letter that contradicted the well-trod path of our imagination. No one had thought to factor in the Andes Mountains, a one-room apartment, or a penniless painter. What surprised me—and I suspect Jules—the most about the letter was not the details but the tone. So full of eager questions and muzzy thoughts. Written, unmistakably, with a mother’s solicitude. Nina Leen, Roof Sunlamps, Senator Hotel, Atlantic City, 1948. © Time Inc. Months later, not long after Jules crashed her father’s boat into a jetty, we were walking back from school together. We wended our way through the woods, dodging briars, climbing the shaded hill leading to Larimore’s General. “I never fall in,” she said. And maybe that was true. If anyone knew her way around a body of water, it was Jules. Her father captained a private ferryboat that carted tourists back and forth between Alma and Digby. He charged his customers exorbitant prices and refused to laugh at their jokes. When Jules’s mom left Canada, she didn’t bother with the waterways. She headed straight for the airport. Jules hadn’t mentioned her mother since the night she brought her mother’s letter to my house. In fact, we’d barely spoken at all over the break. She’d spent her summer passing out life preservers on her father’s boat. I’d spent mine mopping dirty floors at my father’s veterinary clinic. We were both less than thrilled with our fates. But with school back in session and the first day of the term behind us, Jules and I were side by side again. I was eager to commiserate over our summer boredoms and mistakes. Yet Jules seemed out of place, like she’d gone out to sea and returned with only half of herself. Her sarcasm, which I’d always been fond of, veered into dismissiveness, which no one was fond of. And her father’s crashed boat was just one of the many stories I’d heard about Jules that summer. She didn’t offer to tell me about the others, and I felt too embarrassed to ask. “Anything to drink?” Jules asked. She was a small step ahead of me. Despite her short legs, Jules moved with an eager gait. It may have been this extra expense of energy that left her perpetually parched. “I’ve got a few cans of pop in my bag,” I told her. I’d learned, over the years, to come prepared. “Yeah, I know.” She seemed disappointed. Her zipper still wouldn’t zip. We left the woods only slightly scratched by thorns, making our way into an open field. Green grass. Sunlight. Above us, flocks of birds expanded and contracted like jellyfish in the sky. On the far side of the field, there was a two-story brick building with a sign that read “Larimore’s General.” The store was empty and had been for years. After Larimore died, no one wanted anything to do with the place. His sons moved to Halifax, his daughter to New York City. Jules and I were too young to have met any of them. But that didn’t stop us from standing in front of the shop, gazing at the broken glass and aged letters that, despite curling and somersaulting, still spelled out Larimore’s name. Jules headed for the staircase on the side of the building. I followed her lead. We creaked up the steps, then hopped from the stairs to the awning and the awning to the roof. From this high up, we could see the red coast and a few stray lobster boats dotting the bay. By high tide, most of the ships and all of the tourists had found their way back to shore. I’d never understood the appeal. So the tide came in. So the tide went out. Did it matter that, around us, the degree was amplified? Each day the water rose and fell by fifteen meters—the size of a small office building. Who would come to see that? I dangled my feet over the edge of the roof. Jules sat a few steps away, arms locked, knees scrunched, staring. From my knapsack, I grabbed two cans of Pepsi and handed one to her. “It’s warm,” she complained, “and I don’t drink pop anymore.” But she opened the tab and immediately started sipping. Bright scarlet strands, lit even brighter by the sun, swept across her face, blocking it from view. “Your hair’s red now,” I said. “Of what?” Jules took a big gulp of her Pepsi. Her face broke into a scowl at the room-temperature pop. Maybe she wanted fresh-squeezed juice. Maybe I wanted to throw my can of Pepsi at her head. “How much money is ‘not much’?” she asked. Her earrings appeared otherworldly and inexpensive, like common stones on a far-off planet. They were polished and new and definitely not left by any tourist. For one thing, I’d never known a tourist to lose two earrings in the same spot. But Jules of the Clouds, Jules of the Sea, Jules of the Zipper That Wouldn’t Zip had already stopped listening. I was being prematurely cast out of her story, demoted to a life of questions without her answers. Like where did those earrings really come from, and where would they take her next? I had my suspicions, of course, entwined with my fears. Yet with Jules unwilling to confide in me, I had no way to confirm or deny what had actually occurred. I could only speculate: More letters must have arrived from Jules’s mother that summer. More wavy blue words and maybe a souvenir or two. Perhaps Jules had even written some letters of her own. There could be a whole encyclopedia of occurrences that I would never hear about, because this was their secret and not ours. When I came home that afternoon, I found my parents and my sister all bunched together on the couch, watching another movie with screeching cars and smoking guns. This time, though, they were actually paying attention. My mother mouthed an inaudible “hi.” I walked past her and into my bedroom. After subtractions—pens, notebooks, a few CDs, and a sweater I now despised—$387.52 remained. I placed it in an envelope and sealed the top so I wouldn’t be tempted to change my mind. The next afternoon I handed the money to Jules. She accepted it with a cashier’s fleeting smile. Combined with her own savings, she had enough for a plane ticket. Whether she bought the ticket for herself or sent one to her mother, I couldn’t be sure, because Jules never went to Chile and her mother never returned to Alma. 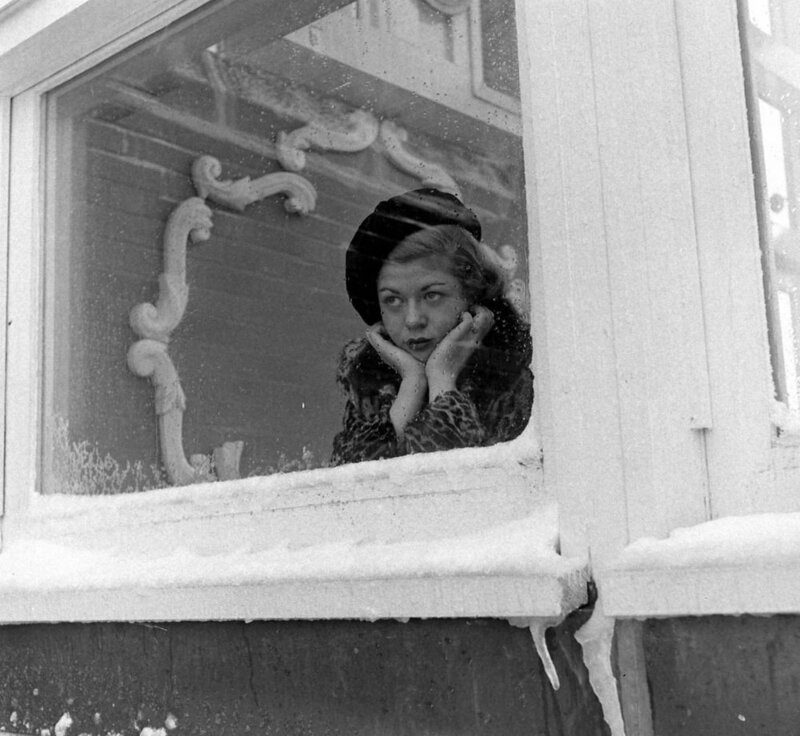 Though one night, after Jules and I had gone to a concert in Moncton and smoked our first cigarettes, she did tell me, with a strange excitement, about how her mother had left the painter. “And you know what this guy kept saying—you’ll get a kick out of this—he kept saying that it was just because his paintings wouldn’t sell.” And Jules laughed and laughed as we drove along the tree-lined road, stopping only when we found ourselves back home. Nathan Moseley is a fiction writer and poet from Atlanta. His work can be found in Litro Magazine and on The Other Stories podcast. He received his MFA from Sarah Lawrence College and has worked as the translation editor for LUMINA Journal.